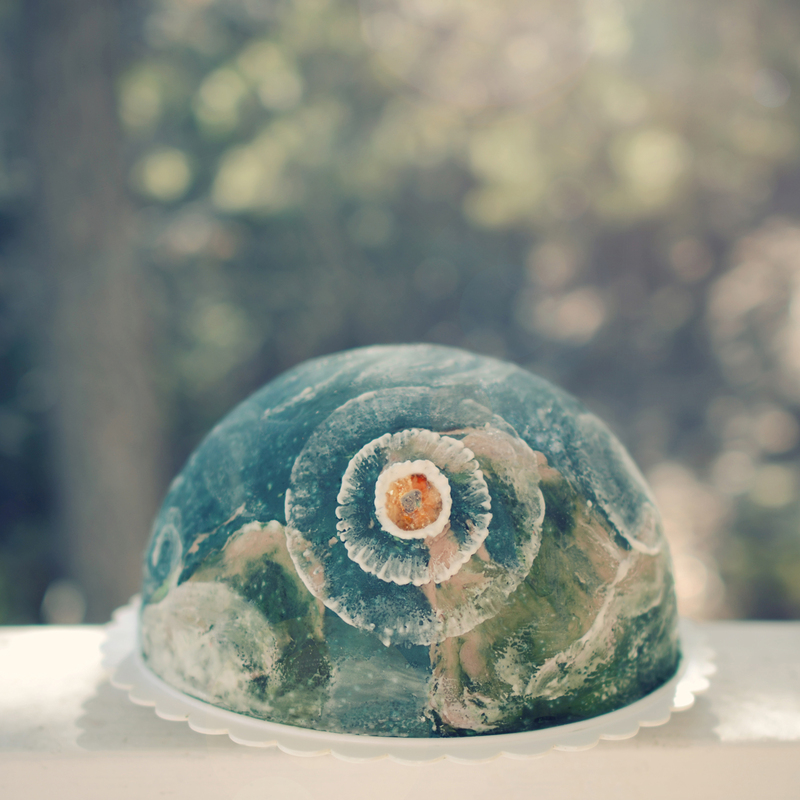 “Earth” cake commemorating one of our most-recent mass extinctions (not OC, found in /r/food). 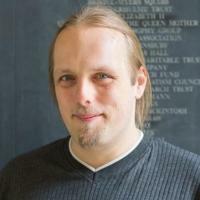 This link was originally posted to /r/megaearth. See more things from Dan's Reddit account. I’m a big fan of pizza. I use it to celebrate people moving house back to Aber; I use it to bribe people to help me move house; I’ve been known to travel into the next country over in search of the “right” one; over the course of the 300 or so Troma Nights I hosted between 2004 and 2010, it got to the point that our local pizza place would bring our food in through the front door and directly to each consumer; and once we got as far south as Naples, finding the world’s best pizza was among the first things on Claire and I’s minds. I like pizza: you get the picture. More-lately, I’m also a big fan of making pizza. I’ve always enjoyed making bread, but over the last five years or so I’ve become particularly fascinated with making pizzas. I make a pretty good one now, I think, although I’m still learning and periodically experimenting with different flour blends, cooking surfaces, kneading techniques and so on. Those of you who know how capable I am of being a giant nerd about things should understand what I mean when I say that I’ve gotten to be a pizza nerd. 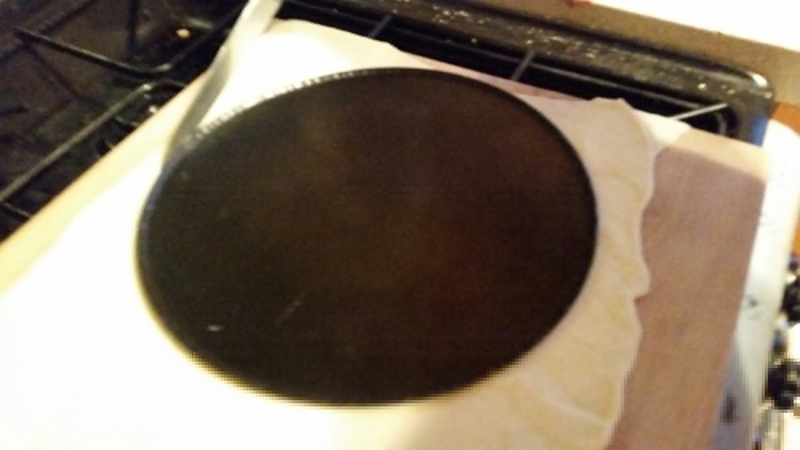 Normally, dough should be stretched into a circular shape: but today, I needed a perfect circle of an exact size, so I cut it instead. In pizza-related circles of the Internet (yes, these exist), there’s recently been some talk about pizza cake: a dish made by assembling several pizzas, stacked on top of one another in a cake tin – ideally one with a removable base – and then baking them together as a unit. 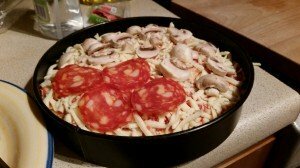 Personally, I think that the name “pizza cake” isn’t as accurate nor descriptive as alternative names “pizza pie” (which unfortunately doesn’t translate so well over the Atlantic) or “pizza lasagne” (which is pretty universal). In any case, you can by now imagine what I’m talking about. What I’m talking about is an artery-destroying monster. 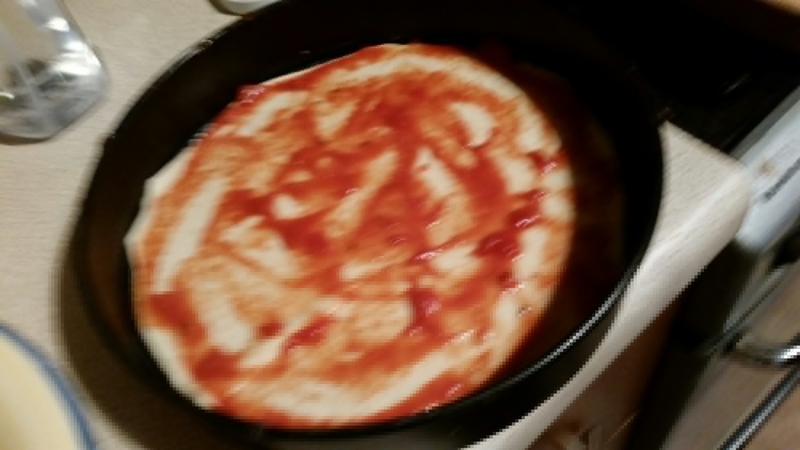 Spreading sauce onto the bottom layer of the pizza cake. Not wanting to squander my dough-making skills on something that must be cut to size (proper pizza dough should always be stretched, or in the worst case rolled, to size – did I mention that I’d been getting picky about this kind of stuff? ), I opted to go for the lazy approach and use some pre-made dough, from a chilled can. That was probably my first and largest mistake, but a close second was that I followed through with this crazy idea at all. 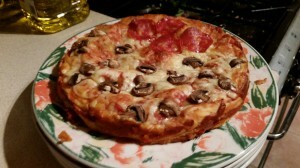 This pizza cake is one-third meaty, two-thirds veggie: the fillings go all the way down across four layers of pizzas. I didn’t have as deep a cake tin as I’d have liked, either, so my resulting pizza cake was shorter and squatter than I might have liked. Nonetheless, it came together reasonably well, albeit with some careful repositioning of the ingredients in order to provide the necessary structural support for each layer as it was added. I eventually built four layers: that is, from bottom to top – dough, tomato, cheese, pepperoni & mushrooms, dough, tomato, cheese, pepperoni & mushrooms, dough, tomato, cheese, pepperoni & mushrooms, dough, tomato, cheese, pepperoni & mushrooms. As I went along I found myself thinking about calzone. Regardless of anything else, though, it smelled amazing as it came out of the oven. Using a cake tin with a removable base turned out to be an incredibly wise move, as it proved possible to separate the food from its container by simply running around the outside and then tapping the tin from underneath. It had the weight and consistency of a cake of similar size, and smelled richly like freshly-based bread and cheese: exactly what you’d expect, really. I sliced it into six wedges, “cake-style”, and served it with a side salad to my courageous test pilots. At a glance, it looked like the thickest imaginable pizza. Sadly, this was the most-awesome part of the experience. Ultimately, though, the experience wasn’t one we’re likely to repeat: the resulting dish was less-satisfying than if I’d just gone to the effort of making four regular pizzas in the first place. It was impossible to get an adequately crispy crust over the expanded surface area without risking burning the cheese, and as a result the central bread was unsatisfyingly stodgy, regardless of how thin I’d rolled it in anticipation of this risk. Having toppings spread through the dish was interesting, but didn’t add anything in particular that’s worthy of note. And while we ate it all up, we wouldn’t have chosen it instad of an actual pizza unless we’d never tried it before – once was enough. But that’s just our experience: if you give pizza cake/pie/lasagne a go, let me know how you get on. 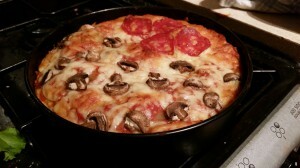 Meanwhile, I’ll stick to making my own dough and using it to make my own regular, flat pizzas. The way that the pizza gods intended! 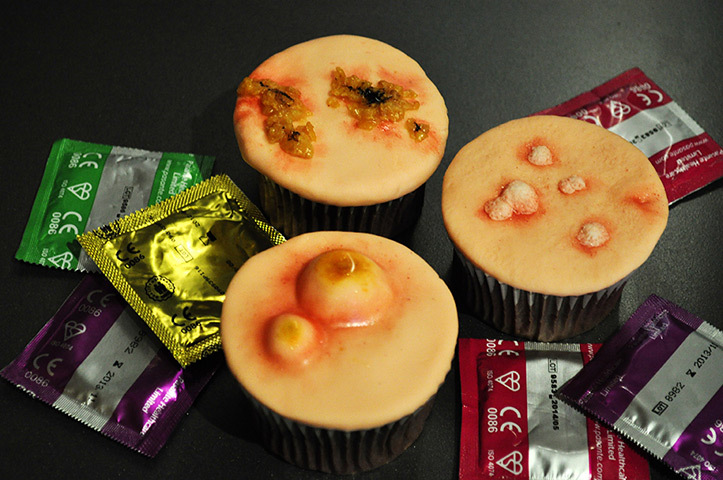 STD Cupcakes: diagnose yourself while you eat! This link was originally posted to /r/WTF. See more things from Dan's Reddit account.